1 For banana cream, purée bananas, cream and milk in a blender until totally smooth, add sugar, cornflour, yolks and ½ tsp sea salt and blend until homogenous. Transfer to a saucepan and whisk continuously over low-medium heat until thickened. Bring to the boil, whisking continuously to cook out starch (2 minutes). The mixture will resemble thick glue, bordering on cement, with a colour to match. Transfer to a clean blender and add butter. Squeeze gelatine to remove excess water, add to blender and blend until smooth. Colour the mixture with yellow food colouring until it is a bright cartoon-banana yellow. (It’s a ton of colouring, I know, but banana creams don’t get that brilliant yellow colour on their own). Transfer to a container and refrigerate until completely cool (30-60 minutes). Whisk cream and icing sugar in an electric mixer to medium-soft peaks, add banana mixture and whisk until evenly coloured and homogenous. 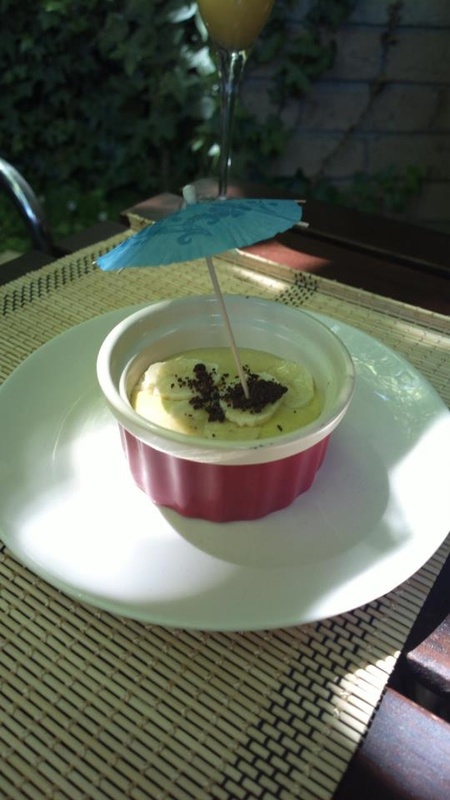 Banana cream will keep stored in an airtight container in the refrigerator for 5 days. 2 For chocolate crust, preheat oven to 150C. Beat flour, cornflour, cocoa, 65gm sugar and ¾ tsp sea salt in an electric mixer on low speed to combine. Add 60gm melted butter and beat until mixture forms small clusters. Spread on an oven tray lined with baking paper and bake, breaking up crumbs occasionally, until slightly moist to the touch (20 minutes). Cool completely, then pulse in a food processor until no sizeable clusters remain. Transfer to a bowl, add remaining sugar and 1/8 tsp sea salt and toss with your hands to combine. Add remaining melted butter and knead it into the mixture until it is moist enough to knead into a ball. If it is not moist enough to do so, melt an additional 14gm butter and knead it in. Press evenly into base and up sides of a 25cm-diameter pie tin and refrigerate until chilled. 3 Pour half the banana cream into the pie shell. Cover it with a layer of sliced bananas, then cover the bananas with the remaining banana cream. The pie should be stored in the refrigerator and eaten within a day. Serve it topped with extra banana if you like.